December’s Cold Moon finds us beneath a dusting of snow as the White Lady travels the sky in her wagon. Snowflakes tumble to earth when Dame Holle is shaking her feather bed. 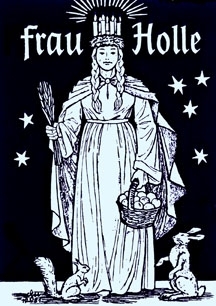 As the Teutonic (ancient Germanic people) Goddess of Winter, Dame Holle, Holla, Hulda, or Holda is the Mittwinterfrau (Midwinter Goddess) wearing linen as white as snow, crowned with candles and dressed in straw. She will shake her feather bed and the magical snowflakes will become glistening specs of gold that chime. She is a fate goddess who spins the threads of life and assigns destiny. So industrious, her right foot is flatter than the other from working the spinning wheel pedal. She is called goose-footed after her sacred bird. Holda is said to be the source of the fairy tale character Mother Goose. She is the kindly, hidden one who haunts lakes and fountains. To find her, you must jump into her magical well. You begin the quest by offering her cakes and milk upon bedtime. Then resting snuggly under cozy comforters, fall into a deep sleep and dream of the forest floor and a clearing with an old apple tree. On your way to the forest you see a flock of geese flying overhead, led by none other than Mother Goose herself – the goose-footed spindle goddess. You come upon an old well. You peer into the well and see a glimmering object within. You lean deeper into the well and begin to tumble downward onto a spinning wheel made of gold. With a thump you land in the midst of a stand of elder trees and hear their scratching branches jangling in the wind. The Hylde Moer she is called. The elder tree is sacred to the Winter Goddess, its Old High German name is Holantar, its spirit guards the road to the Underworld. You are at a hedgerow of elder, at the crossroads of the old year and the new one, in a place out of time. You see before you The White Lady. She is here to help you leave the past behind and draw nearer to a bright future. Read More.